If you prefer, you can use keyboard shortcuts instead of choosing menu commands to perform tasks on your Mac. To do so, you press down your keyboard’s Shift, Control, Option, and Command keys while pressing another key. Memorizing these popular Mac shortcuts save even more time. 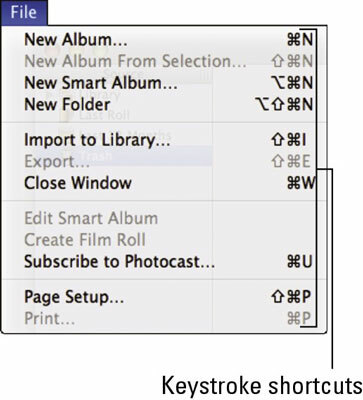 Every program includes dozens of such keystroke shortcuts, but the following table lists the common Mac keystroke shortcuts that work in most programs. Many programs display their keystroke shortcuts for different commands directly on their pull-down menus. Instead of describing the modifier keys to press by name (such as Shift), most keystroke shortcuts displayed on menus use cryptic graphics. For example, if you hold down the Command key and then press the S key, the S key is modified to behave differently. In this case, holding down the Command key followed by the S key (abbreviated as Command+S) tells your Mac to issue its Save command. 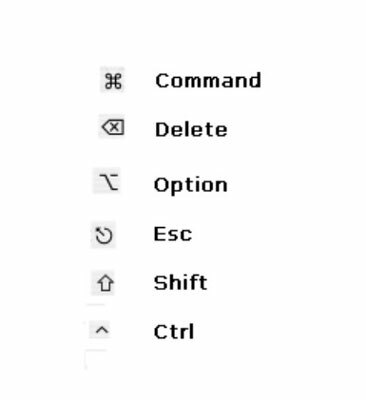 Most shortcuts involve pressing two keys, such as Command+Q (the Quit command), but some shortcuts can involve pressing three or four keys, such as Shift+Command+3, which saves the current screen image as a file.